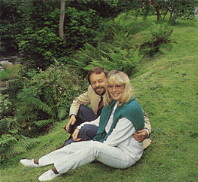 In a secluded, wooded corner of the Isle of Man, next to an old water mill which has a spectacular panorama of the river and - in the winter - a view of a 70-foot waterfall, Cynthia Lennon, former wife of Beatle John Lennon, lives with her close friend and business partner, Jim Christie 44, also from Liverpool. Cyn, as she is known, at 48 still retains her soft Liverpool accent and blonde good looks. John Lennon, whom she met when they were both art students in Liverpool, was shot dead outside the Dakota apartment building in New York eight years ago. But he is again much in the news. Two new books on his life have just been published portraying two very different John Lennons. The Lives of John Lennon by Albert Goldman has nothing good to say about the man, alleging that he had a homosexual affair with Beatles manager Brian Epstein and that he was a drug addict right from the early days. On the other hand, John Lennon - My Brother, written by his half-sister Julia Baird and Geoffrey Guiliano, published this week (see Inside Story), paints a much kinder and more loving portrait of one of pop�s greatest singer/songwriters. 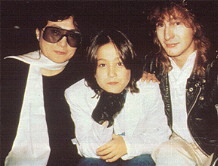 Next month sees the release of a full-length documentary film, Imagine, with much original material and commentary entirely constructed from recordings of the voice of John Lennon himself; and there is the continuing success in the United States of Cynthia and John Lennon�s pop musician son, Julian Lennon. In an exclusive interview, HELLO! 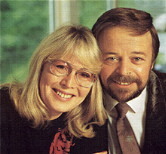 Spoke to Cynthia about her life with John in the limelight and her very different, quiet life today on the Isle of Man. The American Albert Goldman claims to have spoken to 1,200 people to research his sensational book The Lives of John Lennon. Did you assist him? "No, I didn�t, and I don�t know anyone close to him who did. I was pursued for four years when we were living in Cumbria and I�d get phone calls from one of his researchers saying that he wanted an interview and I said that no way would I help him. I read the book that he did on Elvis Presley and I was so shocked at that that I wasn�t going to help him with a book about John; there was no way I was going to be involved in it. "The man is such a character assassin. The researcher even threatened to camp out opposite. He really harassed me for four years and even followed me here to the Isle of Man. He went on about how honourable this book was and what an intelligent and qualified man Albert Goldman was. How he�d interviewd all the family - I know that he did interview a cousin in Scotland. I thought I�d heard all this before. John has gone now and he doesn�t have to defend himself, he doesn�t have to fight for his reputation. He can�t. The rest of us can. It�s our uty to respond - even if it does help to sell his book. "What I�ve seen so far is negative, so fabricated. It�s the most negative piece of work I have ever seen. It�s almost as if he has taken a half truth and twisted it, as far as I�m concerned, to the point of no recognition. He�s taken things from a book that I wrote called A Twist Of Lennon and he�s even twisted that. He�s taken a lot from other books, Ray Coleman�s book and Philip Norman�s book Shout! on the Beatles, and elaborated on it and twisted it. I�d like him to be portrayed as a real man, not this shadow of a man. I haven�t read John Lennon - My Brother, but it sounds okay." When did you meet John Lennon? "We met at art school in Liverpool. I was 18 and he was 17. He'd just lost his mother. I'd had a boyfriend when I was 17, he was a lot older than me, about 25. And John went out with a girl called Barbara for a couple of years before he met me. So we'd both been through the first flush of romance. I was a bit apprehensive of him. I thought he was very funny, but in a rather cruel sort of way. He was fighting the world. I'd just become a Hiltone blonde and lived in a little room with a bathroom next door where you put a shilling in for a bath. Paul's girlfriend Dorothy had the one next door. 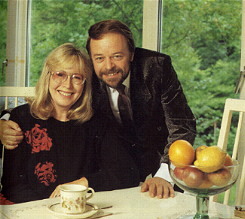 I was 22 and John was 21 when we got married. I was five months pregnant at the time. I didn't known anything about birth control. Neither of us were thinking about the consequences. When we found out, we just said: 'My God, what are we going to do?' If he'd said at that point that he wasn't ready for marriage, I would have accepted that. I wasn't out to trap him. "I mean, it ruined my career at college: I was taking my NDD, my teacher's diploma. His career started and mine finished. If I hadn't met John and got married I would have been an art school teacher or gone into the commercial art world. "Brian Epstein had a flat near the art college, in Faulkner Street, and we moved in there until we got ourselves sorted out. I always got on great with the others. 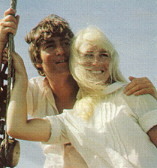 I was a little bit older than them, so I had that edge, and I was also John's girlfriend, so we had a lot of fun together. 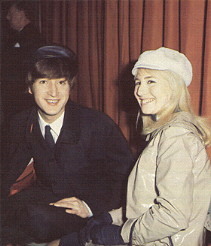 What John did was accepted and if I was John's girlfriend that was accepted as well." Was it many years before the money for the Beatles' hits started coming in? "When I was about 23, 24. Just about the time that Julian was born, they took me off. We never ever saw any of the money anyway at that point, as it all went into the coffers and was looked after by accountants and people. When we moved to Weybridge I had �50 a week to spend on housekeeping, but I never spent it on housekeeping because all the bills went off to be paid. John did not carry money around with him. He very rarely signed a cheque. It was all done for him. The money men, the accountants. We were children in a world of a lot of money. But John was very good. Those were the days when shops like Asprey's and Harrods would open specially for them. John would buy me dresses, negligees, gold jewellery and a watch, things like that. I've still got them. There's no mention of all that in this book." Moving south, what was that like? "It was beautiful. We moved from Liverpool, actually Hoylake where I was staying with Mum. 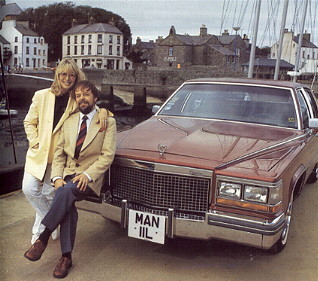 John had just started touring, we moved to a maisonette near Cromwell Road and I had Julian. There wasn't a lift and we had to go up and down stairs. Eventually there were always crowds of people outside when we went out so we both agreed we ought to do the proper thing and go and buy a mansion in Weybridge. That was in 1964 and the mansion cost �19,000." When did you split up with John? "It was in '68, after we all went on the trip to India. I became caught up in the whole thing at the beginning. 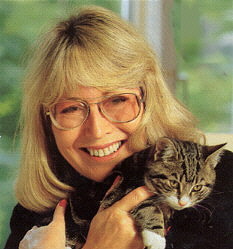 It was my first time away from Julian, my mother was looking after him. I was a suppressed artist and I had the time to actually be creative. I gave up meditation - I did a little bit - and after a while got stuck into poetry and painting, which was much more relaxing for me. John got very heavily involved and so did George, but nobody else did." You have survived two more marriages since John and you seem a very calm, collected person. What would you give as the secret of your survival? "I don't know. I must have a guardian angel somewhere. I guess it's my boring, down-to-earth attitude that probably sent John running and was the end of the marriage. I see things in black and white rather than grey or colours. It's just my upbringing. I'm a realist. "I may have had three marriages, but I've always looked for the real thing, the positive. I've always tried to make things work, no matter what's happened I've always gone plodding on, hoping to find the relationship, the business or whatever. You've just got to be honest with yourself. I could very easily, after John, have thought that I was a total failure. To a certain extent in the eyes of the world's press and everything else I was - 'Poor old Cyn, she's had it' - but inside me I thought: 'No way have I had it. I'm just as important.' I had as many dreams as anybody else to do what I had set out to do." Do you have any benefit from John Lennon's estate now? "No I don't. I recieved �100,000 in 1968, out of that I bought a house worth �25,000 in Kensington and for Julian I recieved "2,500 a year, And there was �100,000 for Julian, which was divided in half when Sean was born - it was to be divided between any children, and that was invested and from that I paid for Julian's school fees. That was it. I've made more money from property than anything else. I sold the house in Kensington for a wacking great profit, moved north and then there was a bit of a grey area. 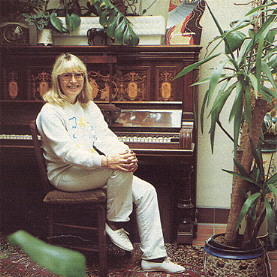 "In 1970 I bought a house in Wimbledon near the tennis club for �23,000. That's what's kept me going. I'm very grateful that I had some money to start with. Whatever work I've done, the money I've earned has been a bonus. I'm okay. But I'm not well off - still struggling for a pension. I enjoy the benefits of being able to go out to dinner, of having a holiday, but I couldn't go mad. I'm comfortable, but if I wasn't working I wouldn't be. I do have to work. "Julian's having a good time. he's okay. He's going out with Hollywood actress and model types. They're not really the marriageable ones. The trouble is he's not meeting real girls, serious people. . . I have to be careful what I say. . . so that will no doubt come in the next four or five years, or whatever. "It was a difficult time for him when his father died, he was only 17. If you lose a very strong person like that you lose direction for a while. he left home, which was great for him. He left the nest at an early age so he's quite capable of looking after himself. He's had to learn the hard way, Julian, he really has. He hasn't had anything handed to him on a plate. The trust fund he recieved paid for his house this year and he's got a mortgage on that, so he has got his head screwed on as far as money is soncerned. At least he is leading the life of a prosperous rock musician. He's been successful so far, but he knows that if it doesn't work out he can always branch off into other directions. I haven't seen his new place yes but we are going out when the film comes out - it was meant to be a holiday, but I can see that I'll be working out there." What is your relationship with Yoko Ono? "It doesn't exist really. I don't hold any bad feelings towards her. If it hadn't been her, it would have been somebody else. It was something that happened. For the film about John we had tea at the Russian Tea Rooms in New York. 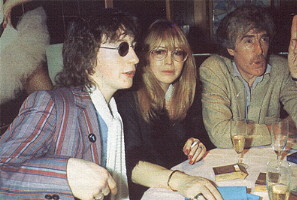 There was Yoko and Sean, Julian and his girlfriend of the time, Jim and me. It was a bit strained, but we don't really have anything in common. All that time isn't really part of my life now. I still keep up with Maureen (Starr, first wife of Ringo) and Patti (Harrison first wife of George), occasionally. But I don't see the others." How did you meet Jim Christie? "Jim was a neighbour and was interested in motorbikes. He taught Julain to ride the little motorbike that John had bought him. 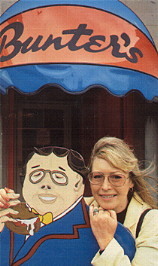 It was about 1974, I was married to Mr Twist at the time and he wasn't really interested in Julian. We didn't get together for a long time, not until 1982. We're not married and we're not planning to get married. I think the reason is that I'm a serious person. I would never have affairs. After John and I broke up, as Julian was growing up, I wanted him to have a father and so I married the men in my life. Now Jim and I are partners, we live together, we work together and we have a stronger relationship than any marriage. The situation is accepted by everyone; Julian accepts it and we've reached a time in our lives when we don't need to get married. We feel right as we are." What brought you to live on the Isle of Man? "We came here from Cumbria to escape from being at the end of a phone. When anything was on about the Beatles or Julian, I was always being pursued and harassed. I was getting really fed up with it because I was trying to do my textile designs. "Everything I was trying to do was being coloured by the legend. At least we've stepped away from it since we've been on the island. We've got involved in more businesses and more projects. On the mainland I was designing textiles for a company called Wilshire, which was taken over, and I did some designer napkins for Deeko, and that too was taken over. "For the last six months we've had the restaurant. It was fate that we got it. When we first came to the island we stayed at a bed-and-breakfast place with a lady called Mrs Jennings. Within walking distance was this restaurant called Bunter's; we fell in love with the atmosphere, but didn't have any ideas about running a restaurant, none whatsoever. We got very friendly with the owner, who was 60 at the time. he decided he had had enough of it and said we were the people he would love to buy it off him. So we started thinking about it. "We'd only come here for a sabbatical, to take a year off and that's what we were doing before we got started to get bored stiff and this came along. Now we are there every evening. I tried running a bistro before in 1978, but it didn't really work, and my marriage to John Twist had broken up. Then it was time to change direction. It led to my first exhibition of cartoons and drawings in America and led me more into the artistic side of life. But as Jim's parents had run restaurants, we decided to give it a go and we're really doing okay with it." How did you become involved in your other local business - your own perfume range? "The actual island is a very small place and you get to know people very quickly. I went to the Ellan Vannin factory to choose some perfume, then we got to know the people socially. The idea came about that we should all get involved, bringing out my artwork for the design and the packaging. It all happened gradually over a period of about six months. The factory is 10 minutes away from where we live. Now we have gone into partnership with two other people and we are going to launch a range in the autumn with the perfume Woman, named after John's song. We're working on a range of skin creams and body treatments and a man's aftershave. "I am achieving a dream now, even though I missed out during the Beatle years. I just wish I had as much energy now as I did then!" The following details from pictures featured in Cynthia's Hello Interview show items of her art work. 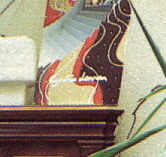 Detail from the picture of Cynthia sat at her piano. 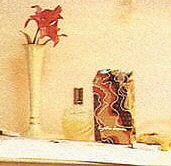 Detail from the picture of Cynthia sat on the floor of her home studio. 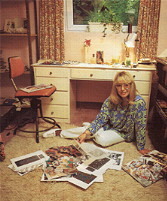 Magazine photographs advertising her textile range, and some drawings of her designs. The resemblance is uncanny - so much so that even now when Julia Baird visits her native Liverpool, shopkeepers still stop and ask her if she's the late John Lennon's sister. 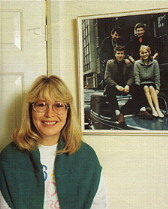 Julia is in fact the Beatle's half-sister. She has always refused to be drawn into the media circus surrounding his death but has finally broken her silence to write what she knows is a true version of John's early life. The result is the book John Lennon - My brother (co-written by Geoffrey Giuliano and published by Grafton this week). "I have written this book to put the record straight," says Julia. "Horrible things have been said about our mother that would never have ben said if John were still alive and so because he's not here to defend her, I thought I had better do something. 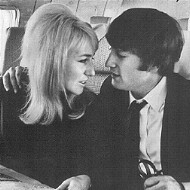 "I wanted to justify what happened when John was five and went to live with our Aunt Mimi. I wanted to dispel the myth that John was thrown away by a nitwit mother who had a child and didn't know what to do with it. This is all untrue." Julia had heard about Albert Goldman's book on her brother but was surprised that his was published at the same time as hers. "I had heard talk about it for years and then when I was in France for a while it was published and I read it on my way home and found it very upsetting. "Goldman never spoke to any of John's close relations and those who really knew him and it made me feel so happy that I had written my book." Julia says Goldman has written John's story from the age of 26 upwards while she has done him from 26 down. "I would refute the suggestions Goldman makes that John was a homosexual. "I wasn't with him 24 hours a day so it's impossible for me to know everything about his life but I can't believe he was gay." Married, with three children, 41-year-old Julia now lives in Cheshire, working as a supply teacher. 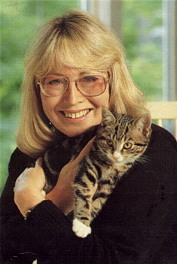 Although her children never met their famous uncle, Julia has told them all about John. "One of my earliest, fondest memories of John was being bounced up and down by him on his knee. He was 11 or 12 then and I was four or five. He was a very warm, generous brother." If Julia's voice falters a little when she talks about John that's because she has one big regret about the abruptness of his death. "I thought we had all the time in the world to see each other but I wasn't reckoning on being so cruelly robbe of him in December 1980 (when John was assassinated)," she says. "The last time I saw him was in 1967 before he went to America. Since then we had phoned each other several times and he kept asking me to go over and see him but I just never got round to it. If I could change anything now, I wish I could have been more decisive and packed my bags to go see him before it was too late."